Registering in the Race: Weeks and weeks ago, I think during the Canberra Marathon, or Orange Running festival, the Woodstock runners were contemplating and brainstorming the good runs the club has been particpating the past few years. And Mcleay River Marathon came up in the discussion, I and few other club members were gas bagging about the event to the other runners who havent been there or done the run. I’ve been there 2 years ago after being convinced by Brendan, Lawrence and Jeff that it is a good course and event. And I did not regret participating it. 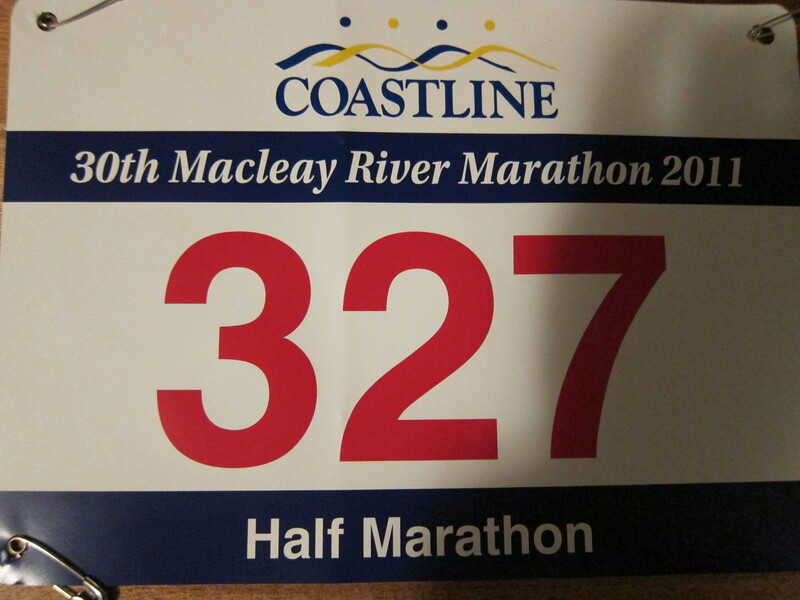 I knew that it is a very very long drive up South West Rocks to do the run, and I would go only if we are able to do a car pool, or get numbers from other keen runners to go up the north coast during the long weekend. It has been talked about that Joe, one of the members who owns Woodland Tours, who rbought us to Canberra two months ago, that ifhe can drive us if a lot of us are going. It has been weeks and months since we advertised and no one has replied, except Sandra … Lawrence and Jeff are going up on their own with their families. Angela signed herself up so it was just Sandra and Angela, and I thought I should to. And we waited but no one was available and keen on that weekend and Angela end up volunteering her car and her good services of driving us up there. We booked a holiday house for the rest of our support crew just 5 minutes away from the start. The Travel: We drove up Saturday morning, leaving Sydney sunny after a overnight rain, and as we drove up closer to the venue for 6 hours, the rain has been pouring and ouring harder. It is not said out loud but you can feel and know the dismayed feelings of the group, looking forward to a sunny long weekend getaway and a run and what we get is rain. Plus, not to mention the area is prone to flooding. We got there and too tired to cook and too full from snacking or a heavy lunch on a mediocre roast chicken shop at Port MacQuarie and just sat in the lounge watching tele, contemplating should we run at the race tomorrow with the background of really pouring rain. We were hoping the reverse of what happened in Canberra happens in Mcleay where after the strong rain, a good sunny day awaits. We tried to be optimistic and agreed that since we all came up 6 hours away from home to do this event, Sandra training for her debut Marathon, we have been eating junk on the road trip, we should at least try and get out there and burn the crap and calories we have been consuming…rain or shine, unless the organizers calls it off because of the dangers of river overflowing then it is not meant to be. Pre-race:I was so worried I was going to do a half-marathon and I did not do any carbo-load, except for the chips I ate for lunch and few choco biscuits. And the rest of the gang already decided to call it a night and went up stairs for a snooze, I pinched and munched on two slices of bread hoping that will help tomorrow. And went to bed, hydrated. I kept waking up listening to the strong rain and maybe on the last time I did wake up, I decided not to run if it was this hard and pouring, I told to myself, there is no way I will be running in this rain and went to sleep. Next thing I woke up hearing someone already preparing so I woke up ate breakfast. Coffee, two Weet Bix, tablespoon full of Chia seeds and honey, hoping the chia seeds will fuel me on the run. Although we are just 5 mins before the start, we are just cutting it fine on the start of the run at 7:30. We are “almost” running late and blame it on my disorgnanized self, I left my GU in the house, we couldn’t be bothered delaying the whole team so i did not go back for it. We passed the Marathon runners who started at 7am, cheered on Jeff. We arrived at the 15 minutes before the race start, queued for our bibs and chips, did our toilet break, I’m glad there was no big queues, got ourselves marked in our calves on the category/race we were doing and just enough time to get into the start mats. No warm ups, no stretches … just the adrenaline of almost being late is keeping us warmed up. 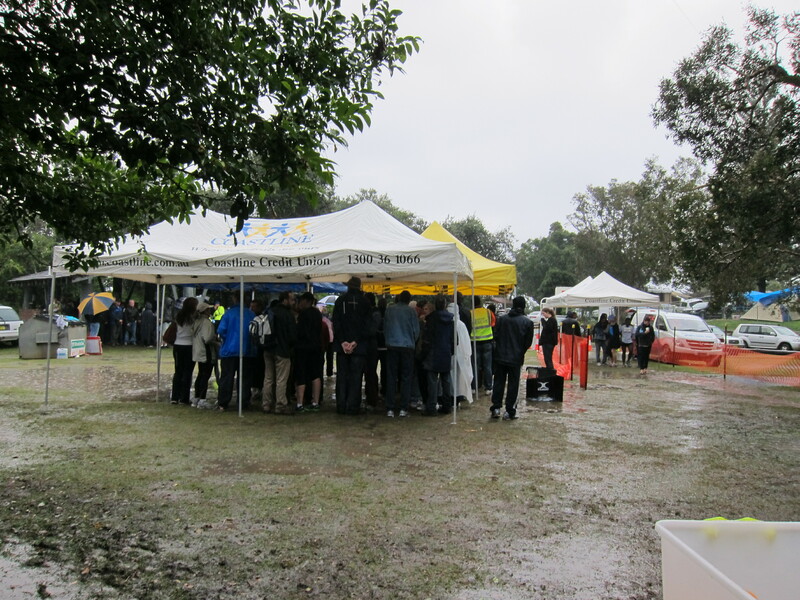 The weather is still not looking great btw, although it has easened up, just very light drizzle every now and again, the start venue is already mushy, we preferred to walk to cross the chute rather than getting wet heavy shoes at the start. The Start: And off we go. Up the small hill pass the walls of Trial Bay Gaol. Two years ago, I ran the marathon (still reigns as my PB), and can not remember that there were few inclines and small hills on the course. Probably because I was taking it easy, slower on a marathon pace? Who knows. But this time I do recognize there were hills but very little and not bad, I knew at the last 5Kms going back there is this hill you have to climb up back towards the town but there were more. There were 200 runners in the half-marathon event that runners are so well spread apart and there are times you think you are running alone in the country. That was what I loved in this event. As if you are doing your own training run on a country road. I liked it because it was uncommercialized, although you run alongside a two way skinny road beside the Mcleay River, and not much witches hat for the motorists on the highway (mind you its an old country road but still its a 100 KPH road) to see the runners. Some areas were marshalled and some are with witches hat. I knew that already from two years ago, despite the risk on running on the open road, I liked the event. You did not have to dodge other runners and you are running in the country. During the half of the run, a female runner marked HG passed me, so I told myself that’s alright she’s not of my same age category, she’s older and probably stronger knowing that 30-49 Females are on their peak. Then next I heard voices behind me saying 18.1 Km to go as we passed 2.9 Km and a very young girl passed HB me accompanied by a male runner passed me, I let them go, the girl looks fitter than me and younger and looks like she has been training. And just as we passed the street of that first “hill” I caught up to miss HG and she said “Hello, you are very strong, ” she said. And so are you I said, I am just following you I told her. So we were running side by side for few hundred meters and I decided to go ahead, trying to feel if she’s just psyching me up and letting me catch her and she’ll just leave me again. So I passed her, and I can feel and still hear her behind me. I told myself I would just let her inspire me and push me all the way through. But then the I felt the dreaded stitch/abdomen cramps at the middle of my abdomen and just tried to relax and massaged it for few minutes and gladly it went away after a minute or so. After a kilometer or so, I can see the young girl’s back Ms HB and looks like she had slowed down and her male companion is not with her anymore. Surprisingly I passed her, and looks like Ms HG passed her too and still behind me. Just before we reach half way and turn around point, there was a famliy cheering the runners and as I passed he cheered on and said “you’re 10th” and heard as i passed “you’re 11th” and i tried to digest what he just said as I was running and realized he just said I am on the 10th amongst the female and Ms HG is 11th. So as we near the turning point to confirm what I’ve heard i was counting the females coming back to towards the finish, and So I am 10th. At that point it inspired me and I let it motivate me to keep that position till the finish if I can. Although at the back of my head, I was still worried about my GUs I left. I am afraid that at some point of the race, i’d have no enough sugar and energy on me i’d fall back behind the pack. I was hoping at least at the water station if they have lollies, I knew I am hoping to much if they have energy gels like the bigger races on the table but no, there was none. So I just made sure i’d drink energy drink and water every water stop I can and hope that the sugar and electrolytes on that drink will make me finish. I did have to stop and do a walk on every water station. Catch my breath and made sure to catch the runner that will pass me whenever I do the stop and walk. So far I passed and still regained my position except one male runner at around 11 KM that passed me, and at the last water station, around 3 or more kilometers to the finish, as I stopped, a female runner passed me of the same category. I saw recognized from the start positioning herself in front of me, and I thought, forget about the 10th place, if I can PB then that would be the next consolation. I still tried to catch her and caught up to her after my water stop and I was behind her for more than a minute, and deciding to just shadow her and chick her at the last hundred meters sprint finish, rather than overtaking her and she overtakes me again, since we still have to run 3 Kms, i am not sure how’d I go. But then while I was behind her, I felt he was going slow or I felt I can go faster in the speed we are currently going this time. I decided and took advantage a downhill bit and overtook her. To the finish: It was actually good to know i have someone behind me breathing on my neck as I tried to run as fast as I can in case she comes back for a revenge, I know she will. Last1 Kilometer I can hear a footstep, and I thought this is her now, and passed a runner, its a male runner, what a relief, and at that time my legs is getting fatigued already. I can feel and I know the finish is just somewhere near and I thought I can see the finish and picked my pace and yet it was more longer than I though, I had to go around the carpark, and already have reached my VO2 max, as I get that puking feeling and it was just too soon i did the quicker pace and I was waiting for ms HB competitor to pass me, still no one, and I can now see the mats, its down hill and I can hear someone behind me so I pushed myself harder not caring if I puke at the finish and surprised to see at the clock as I cross the mats it says 1:45 something. I couldn’t believe it I must have done a PB. I haven’t checked my watch since the 10Km so I did not know how i was going. I did not puke at the end but it took time for me to catch my breath but deep inside I was happy I did a PB, not thinking I’d break the last PB i had two years ago at SMH at 1:47. As it has been frustrating year for me last year due to injuries of spraining both ankles keeping me on getting average results or worse, breaking my PB on this day, I was happy. 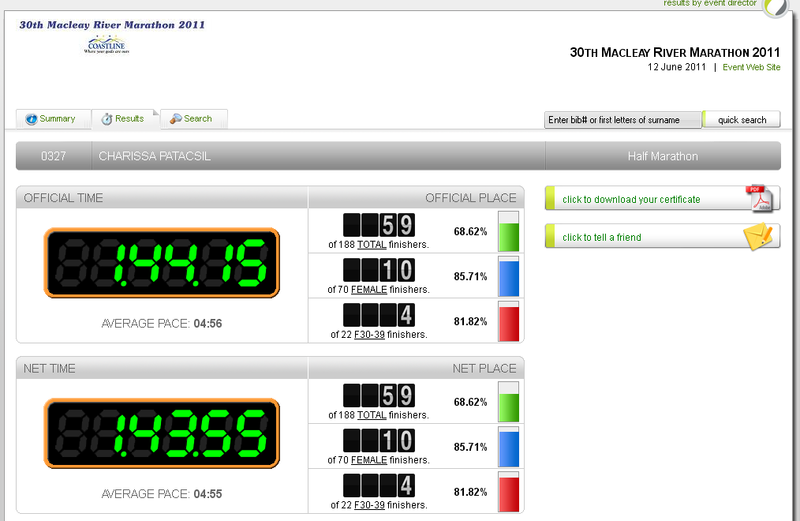 I held my 10th position from 1st half to finish amongst 70 females and a PB!!! I forgot how heavy my shoes were from the puddles i ran, I forgot about forgetting and not having any energy Gel in me, I forgot the miserable weather we ran in. Even Tez wasn’t expecting me home that early and was not there to cheer me on. End: Changed into dryer and warmer clothes as we waited for the rest of the Gang, Lawrence who did a course PB, Sandra who was happy with her time and Angela who almost gave up but we were happy to see her finish. Tez was happy with his 10Km run too. We all went back had a shower and picked the rest of the crew to watch the presentation and see Jeff, who was happy to finally break the 5 hour in his records for the very first time in this marathon. Kris, geekgirlrunner, saw and approached me and I congratulated her on her debut Marathon, good to see her happy and finished. I am hoping I’d get something for at least placing on the age category if the top 10 were not all of my age category, unfortunately they were just awarding 1st place Age/Categories so after few minutes we left. Later in the day, Angela looked the results up online and mentioned I clocked 1:43:55 on my chip time, and I did not expect I did a 4 Min PB! I was thinking it was 2 mins, I’d take that! That makes it a 4 min 43 sec PB from my previuos PB! We left South West Rocks on a better weather but still not Great, Sandra reckons she’d come back again next year :). I am glad the weather did not dampen her spirit about the event and the place. I’d like to come back again if i’d have opportunities to go back. Note: That week I did take note of tapering. 18Km Sunday,4Km Tuesday, 8KM Thursday in between cross training in the gym, skipped the interval training on Thursday night. I also did try and was thinking the whole week, to try to PB this run, I’d be happy if I get 1:46. Verdict: the forces all were on my side this Sunday. Thanks Kris! and you too 🙂 I would have done the full in McLeay if I trained for it, its one of the best venue I liked. 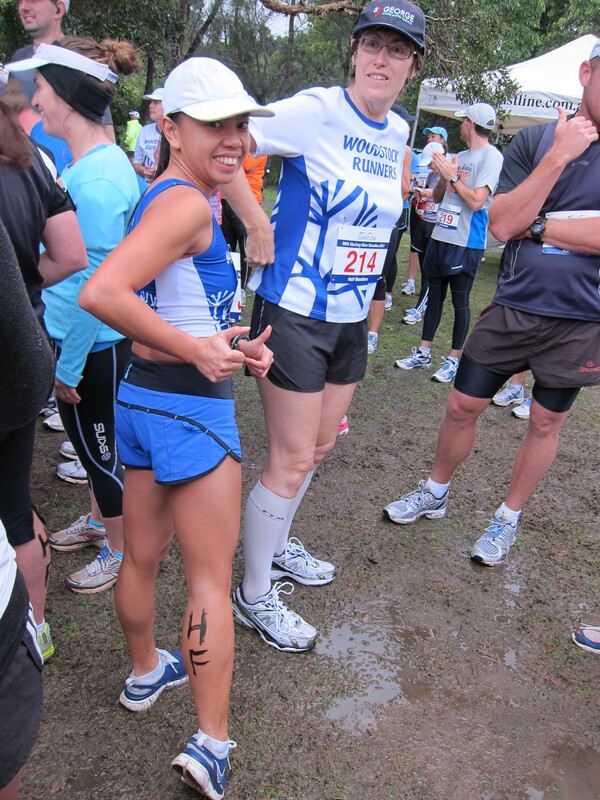 It was better than Canberra Marathon actually, but still got my shoes soaked :(.